Instead of Buying Good Quality 3D Printer, For Lesser Works, One Can Use the 3D Printing Services, Like For DIY Works or Rapid Prototyping. A good 3D Printer will cost more than $1000 at present, even a low end 3D printer which need some work by the user will cost around $250. Additionally, a 3D printer takes some place, which may not affordable to some. Handling and getting used with 3D printer demand some time. 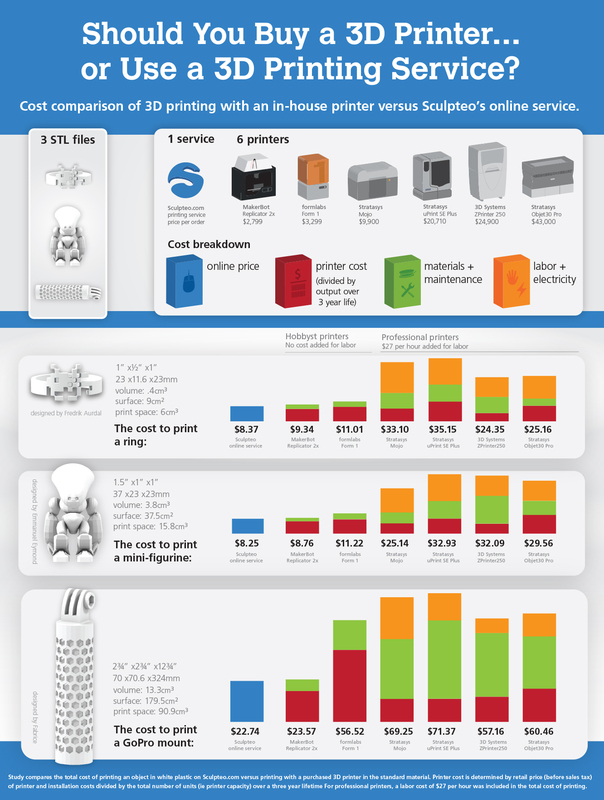 For printing work less than 3-4 per year, one can think about the 3D Printing Services. Definitely, one need to know some basics even for using the services. The space wasted by testing 3D stuffs get printed by a self-owned 3D printer is not less! They take more space. It is meaningless to order a 3D Printing Service in U.S. sitting in India. The cost of courier service can be prohibitive, additionally any custom can simply claim more tax. When you’ll search on Google or any other web search engines, you will include your city’s name or country’s name with the phrase 3D Printing Service to easily find out some names. Definitely it is better if you know the rating by the customers of the service. By nature a 3D printer is like CNC machine. Not always you need a 3D printing when cutting, drilling may work fine. For using the 3D printing services, we only need the 3D file. 3D printable models may be created with a CAD software or via a digital camera and photogrammetry software, among the many other methods. Irrespective of the 3D modeling software used, the 3D model in .skp, .dae, .3ds needs to be conserved to .STL or .OBJ format, to allow the printing service to work. PLA – Polylactic acid or polylactide is a biodegradable polyester derived from renewable resources. This material is most commonly used even by low end systems. From plastic glass to ribbons to seal in supermarket, all are usually PLA. ABS – acrylonitrile butadiene styrene is a common thermoplastic polymer which is commonly used for manufacturing Lego bricks. It is not easy to say, normally printing an iPhone case will cost anything between $6.00 to $36.00. Adding the cost of courier, it can hurt you, be careful to run a query to the service provider about the possible cost. This Article Has Been Shared 6365 Times! Trigger Gesture Events on OS X – do you want to trigger multi-touch gesture events on OS X? Is there a way to do this? Let us See! Cite this article as: Abhishek Ghosh, "3D Printing Services : Basic Guide For DIY Works," in The Customize Windows, September 13, 2015, April 21, 2019, https://thecustomizewindows.com/2015/09/3d-printing-services-basic-guide-for-diy-works/.